Graphic Novel: ILLEGAL. Eoin Colfer, Andrew Donkin, Giovanni Rigano. 144 pages. 2018. Sourcebook Jabberwocky, publisher. My good friend and geography teachin' superstar Chris Heffernan recommended this book to me last month when he got to meet author Eoin Colfer at a book talk near his home in Illinoisville or something. I'm not the geography teacher, don't ask. 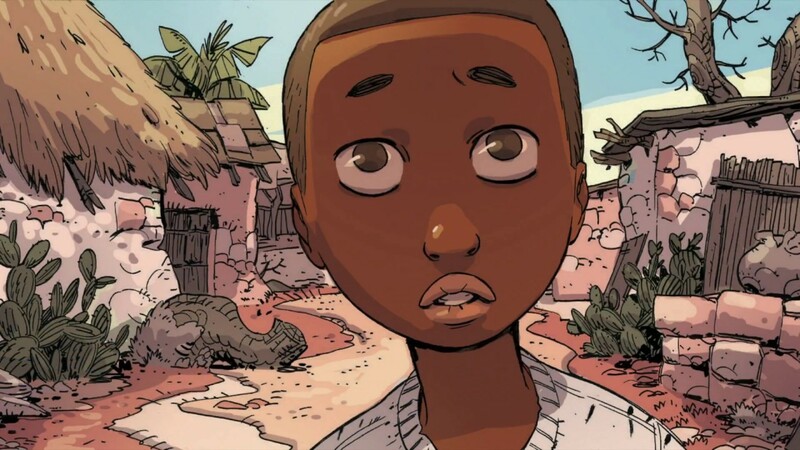 There's been a wave of YA books and graphic novels using the global refugee crises as a setting to both tell emotional stories and inspire action, and it seemed like Illegal was going to be one of those books. I don't know that I was prepared for just how emotional the book was going to be. 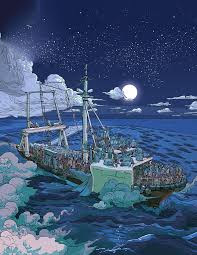 Illegal tells the story of Ebo, a boy from Ghana who's trying to get to a better life in Europe. He has an older brother, Kwame, and an older sister, Sisi. Sisi made the journey some time ago, leaving her brothers behind; Kwame left more recently, and Ebo is desperate to be reunited with him. The path Ebo needs to take will take him across two vast wastes--the Sahara Desert and the Mediterranean Sea, each fraught with the possibility of death at any time. 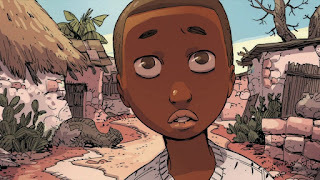 Throughout the book, we see Ebo getting to take two steps forward, and then a step back. Sometimes several steps back. His perseverance through these incredibly harsh conditions is admirable, and he shows a strength that I honestly hope I'll never need to have. Along the way, Ebo is given assistance by strangers who become fast friends, but usually only after Ebo does something for them out of kindness or necessity. Using his wits, hard work, and a beautiful singing voice, he's able to keep going onto the next step of his journey. The artwork by Giovanni Rigano is beautiful, although some of the images are hard to look at. Seeing the cruelty of humanity on one page, the vastness of the obstacles Ebo faces on others, you wonder how anyone can make these journeys at all. Was their life back home so bad that they'd take this risk? Is this their only hope? The answer is often yes. With the conditions of war, poverty, disease, and political instability creating crises in multiple locations around the world on large scales, it seems like the refugees trying to find a safe harbor are more desperate and more numerous than ever. We (the United States) only take in a fraction of what we could, leaving "the problem" to be solved by countries closer to the crisis. 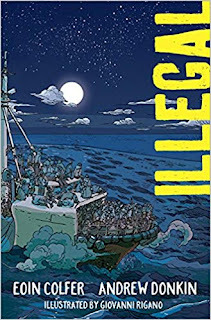 Illegal makes these ideas clear, and being written and illustrated by an Irishman and Italian, the United States is never mentioned, but my feelings of responsibility were palpable. The other recurring thought was about my students. Many of them have these same stories, either in their own life or in the lives of their parents or grandparents. Be sensitive to this when it comes to assignments that center on refugees and immigration; some of these kids are comfortable sharing these stories, for others there's a very real trauma that's still fresh, renewed when the topics come up. Don't treat them lightly. This is a book everyone needs to read. This is a great book to read within an immigration unit for a social studies class, or as part of a current events class of any kind where you're looking at modern day crises and attempts to fix them. I'd say this is most appopriate for grades five and up as far as the language goes, but the frightening themes may move it up a grade or two. Ideally, I'd teach it with two companion picture books: Pancho Rabbit and the Coyote: A Migrant's Tale and The Journey. Pancho Rabbit softens the story of a boy traveling in his missing father's footsteps: Papa Rabbit went north a year ago, and the family hadn't heard from him since. Pancho enlists the help of a coyote (the nickname for these "helpers" getting people across the border, often through ruthless, mercenary means is coyote), and goes through many trials on his way. Definitely a US/Mexico border story, although as with Ebo's there are going to be similar themes throughout. 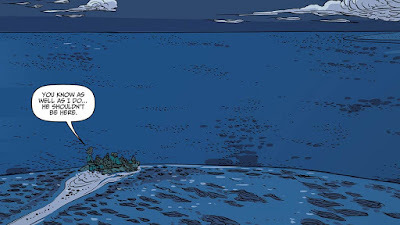 The Journey is a simpler, quieter story than either Illegal or Pancho Rabbit and the Coyote. It's a family fleeing the Middle East after their father is taken from them, and they're heading to Europe. They get help along the way, but the obstacles are still great. Francesca Sanna's artwork is beautiful and makes the story almost lyrical, again, softening some of the true horrors this family faces along the way. Either of these would be fine for younger grades, and the three books together would engage different students for different reasons. Bringing in real world stories, statistics and maps from the migration of displaced persons (refugees) around the world, both historic and modern, would help bring the point home -- that this is an ongoing crisis that impacts groups of people for various reasons. Race, religion, war, famine, poverty, government corruption...it can be unbearably depressing. It's important to point out in each of these stories the protagonists are helped along the way by people trying to do good. These books can inspire us to step up and do the same.